Have you ever woken up in the morning, and had stinging pain in the bottom of your foot as you take your first steps? That's your plantar fascia, the connective tissue that runs from your heel, through the arch of your foot, to the base of your toes. 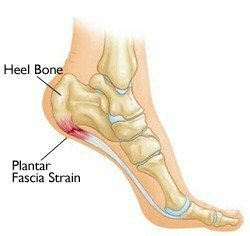 Plantar Fasciitis is the inflammatory condition that causes pain in this area, and can affect the heel or arch of the foot. Some people struggle with the pain their whole life, while others, particularly runners, find that it comes up periodically throughout their lives. Here are the products that I include with links so you can check pricing on Amazon. While the cause of plantar fasciitis is clinically unknown, many runners struggle with pain in their plantar fascia due to a drastic increase in mileage, wearing old/worn running shoes, neglecting to stretch calf muscles, running on hard surfaces, or overdoing hill or speed workouts. All of these conditions increase the stress on your plantar fascia, which is what most experts presume in the reason for the pain. It also is more likely in runner’s with tight achillis tendons, high arches, flat fleet, or who have excessive pronation (if you don’t know what your pronation style is, check out this article: http://www.runnersworld.com/running-shoes/pronation-explained). All of these conditions are known to cause plantar fasciitis, as they put excessive strain on the heel and arch of your foot, which strain the fragile fibers, causing them to become inflamed and in same cases partially torn. Run on soft surfaces at least twice a week, if not more. Opt for trails, grass, sand, or packed gravel whenever they are available. The impact from excessive training on pavement and asphalt can strain your plantar fascia and cause inflammation, especially when combined with other strenuous conditions like increased mileage or wearing worn shoes. Keep mileage increases to 10 percent or less per week. Also keep your hill workouts and speed workouts in ample rotation with “recovery” runs, as overexerting yourself and increasing your mileage too rapidly can invite plantar fasciitis and a number of other injuries. Visit a speciality running shoe store that can help you pick the right pair of running shoes for your stride and pronation style. Also know when to replace your shoes (which is explained in the next section). Stretch your calves, achilles tendon, and the arches of your feet after each workout. To stretch your achilles tendon: Stand with one foot in front of the other, and lean into a wall. Bend the front knee and keep the back knee straight, heel firmly planted on the floor. Hold for five deep breaths, then switch. To stretch your arches: Sit down, and place your foot across your knee. With one hand, pull your toes back toward your shin until you feel a stretch in your arch, hold for five deep breaths, and then switch. To stretch your calves: Place your foot up against the wall (as straight as you can) and lean into the wall until you feel the stretch in the back of your calf. Hold for five deep breaths, then switch. You can also stretch your calves and achilles tendons by doing a common yoga pose called “Downward Dog” where you place your hands and feet flat on the ground, buttocks in the air, creating a “V” shape with your body. Hold for five deep breaths. At the first sign of soreness, consider buying a new pair of shoes. While a lot of running experts out there say you should replace your running shoes after six months, or after 300-400 miles, the best way to know if it’s time is to listen to your body. When the heel and midsole of your shoes break down, they no longer support and protect your foot (and therefore the rest of your body) and can invite plantar fasciitis and other injuries. Without ample support, your plantar fascia has to do all the work, which causes strains and pain in this area. You may have noticed this feeling if you have ever walked all day in shoes like flip flop or sandals, and then had very sore feet at the end of the day. It’s because shoes like these do not offer support to your heel and arches, and therefore your body relies heavily on the plantar fascia ligament. You will know it’s time for a new pair when you start getting soreness in the heel and arch of your foot. Brooks running shoes are widely known as the best running shoes for Plantar Fasciitis sufferers. They come in many different colors as well as running styles so be sure to read the reviews of the ones that you like. 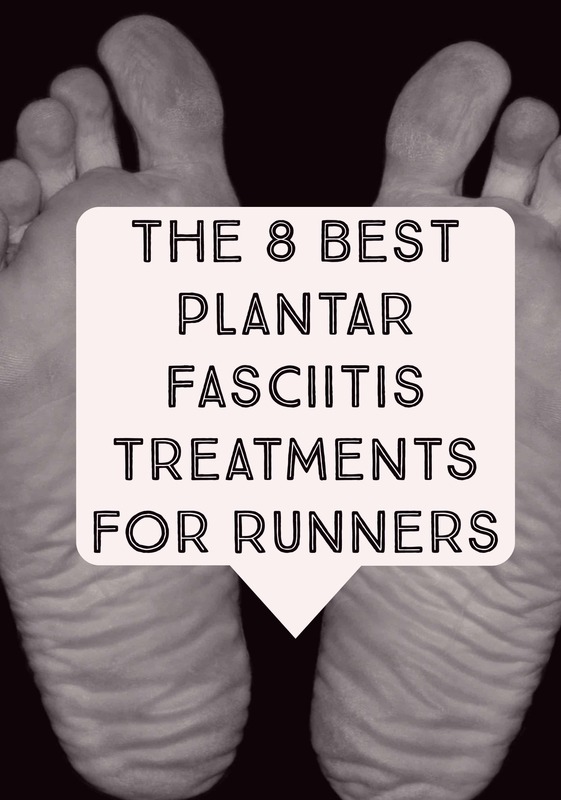 We detailed out several other 7 types of running shoes that are specifically designed for Plantar Fasciitis, v﻿iew them here. Massage your plantar fascia by rolling a golf or tennis ball under your bare foot between your heel and the base of your toes. You can also roll a frozen water bottle on the affected area to help reduce swelling and pain. Avoid wearing flip flops, high heels, or any other type of shoes that don’t offer cushioned support to your midsole when you are not running. Taking the stress off your arch and heel, when running and not running, is what will help you recover the quickest. Apply heat or ice. These treatments have different results for different people. In some people, adding heat intensifies the pain, where in others it helps them relax. WebMd.com suggests that you do “contrast” baths, switching from hot to cold water every few minutes as an effective home remedy. If hot water works for you, then consider adding epsom salts, which are known to help reduce the pain, as well as repair sore muscle fibers. Wear a night splint. Available for purchase at most pharmacies or online, these special nighttime splints gently stretch the plantar fascia ligament and the achilles tendon while you snooze, and prevent them from feeling tight and sore in the morning. Invest a special foot wrap. Depending on where the pain is most concentrated, there are special foot products out there that can offer relief. If the pain is primarily in the arch, there are several arch supports on the market that you can add to your running and daytime shoes. There are also arch wraps (that have a velcro strip on the tops and wrap around your foot, rather than going directly into your shoes) and heel wraps for those who experience pain primarily in their heel. I like the Run Forever Sports brand as it's more of a glove rather than a velcro brace. The glove fits firmly and provides support through compression. The velcro brace may slide as you move your feet. If you are planning on being stationary for a specific amount of time the velcro ones are perfect for you. If the pain is severe, or lasts for several weeks, visit a podiatrist. You could be suffering from a partial tissue tear. While the injury is non surgical, it can take anywhere from 6-12 weeks to heal. In most cases the only way to heal a tear in the plantar fascia is to lay off of running and utilize cross training like biking and swimming until you can run pain free. In some cases, the pain is chronic. While the chronic pain is classified as “incurable” there are several clinical treatments such as orthotics, foot taping techniques, cortisone injections, physical therapy, and anti-inflammatories that can decrease the pain significantly. If you think you might be suffering from chronic plantar fasciitis, visit a podiatrist to receive a diagnosis.